On Sunday, I’ll have a Super Bowl chat open for everyone. All are welcome, even Patriot fans. So I assume most of us hate the Patriots and want the Rams to win? The Patriots are aiming to become only the second team in NFL history to lose 2 straight Super Bowls (Buffalo Bills lost two in a row…TWICE), and I hope the Rams send them there. My biggest fear is that the Rams defense will follow the same flawed game plan that the Chiefs and Chargers tried. They rushed 3 men (sometimes 4 at the most) so that they could drop 8 men back into coverage. With 8 men back, everyone will be covered, and Tom Brady can’t complete a pass, right? How did that work out for you guys? No. Instead, you must go after Brady with all you have and make his life miserable. The Titans did that, and the Pats only scored 10 on them. It works. Win or lose, it appears we will have our new coach in place Monday. You know my thoughts already. I am against hiring another inexperienced coordinator as our head coach (in this case, Brian Flores is an assistant linebackers coach, and NOT a coordinator). I am against giving our vacant DC and OC coordinator positions to inexperienced men who have never been coordinators before. I am against firing Darren Rizzi and replacing him with one of Flores’ buddies. Stephen Ross, once again, is handing auditions to unproven men, instead of finding experienced winners. Again. I’m on record as being against Flores, and it’s up to him to prove me wrong and shut me up. Until then, I will continue to question Ross’s logic in promoting an assistant LB coach to our head coaching job. Especially when so many others have failed to go from the Patriots staff onto a successful head coaching career elsewhere. It discusses his “journey,” but I can sum up what he says: He started in the personnel department (seriously, the guy had an office job in H.R. a few years ago). He ASKED to become a coach. Seriously, those were his own words in the video. They let him be a quality coach on offense, whatever that means (Most defensive geniuses have studied defense their entire lives; our coach, on the contrary broke into the Patriots organization in human resources and was handed a job on offense). There is NO HISTORY of him being a strong defensive coach, let alone head coach. We are in big big trouble. But, at least Adam Gase is gone! It still puts a smile on my face each time I write that. 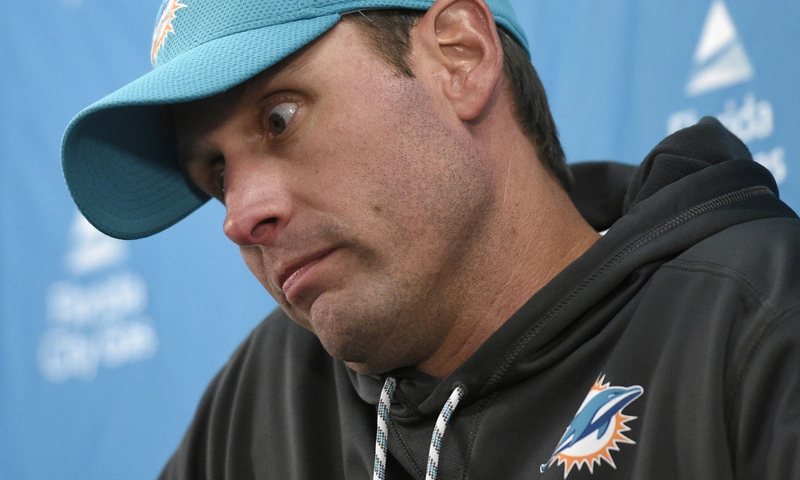 Lots of rumors out there about Darren Rizzi being gone. A guy with a million years of NFL experience is let go in favor of an assistant linebacker coach who just a few years ago was a clerk in the scouting office. Rizzi had some flaws, but the guy was prepared and he did not suffer fools. Was there a more loyal Dolphins coach? LOL, we told you 40 times that John Harbaugh was the Ravens special teams coach who got promoted to the big job and won a Super Bowl a few years later! I prefer Rizzi over Flores because Rizzi has been a coach most of his career. Not head coaching experience, but at least he has experience. Something must be really wring with Mike McCarthy if no one gave him a job. Go figure. LOL at yourself and the other 39 people that said so. He was the DB coach,NOT the ST coach when he was promoted. “n 2007, after serving as Eagles’ special-teams coach for nine years, he became their defensive-backs coach. This fulfilled his request to head coach Reid and improved his chances of landing a head coaching job since executives at that time viewed special teams coaches as unqualified to move up to head coach. I stand corrected on that one. He did indeed serve a year as a DB coach directly before the Baltimore job. And he had no HC experience on any level. I don’t buy the tanking articles whatsoever. Are you going to tell a kicker to Miss On Purpose? Are you going to ask your QB to fumble so we lose? Being bad occurs because teams are bad. Not because they choose to be,. Is it me or is Philbin trying to sneak his little finger in his nose?